While Copyscape seems to be the go-to site for checking whether your content has been scrapped or published elsewhere without permission, there are other tools available that are equally good, or so they claim. We often use Copyscape on TechWiser, but as it turns out, they are changing the pricing from April 2018. So, instead of paying a fixed price of 5c for an article, you will now pay 3c per search for 200 words and an additional 1c per 100 words. This means a 1200 word article will cost you $0.13, instead of $0.5. That’s more than 100% increase in price for us. So, we decided to take a look at some of the Copyscape alternatives to find out if Copyscape is still worth the price. To test these online plagiarism checker tools, I will deliberately write a para with some parts of it copied from other websites, just to see how good the tools are at checking my, er, plagiarised content. To be consistent and fair to the plagiarism checkers, I will create and use 5 data samples that have been plagiarised from different well-known sources. The content has been “inexpertly” rewritten to fool these tools. To make things simpler, I will post screenshots of only 1 of them. Service providers will be scored on a scale of 0 to 5 where higher is better. So, a 4/5 rating means the plagiarism checker tool was able to catch 4 samples out of 5 for plagiarism. Let’s find out what you are paying for! The below text was taken from NYTimes. 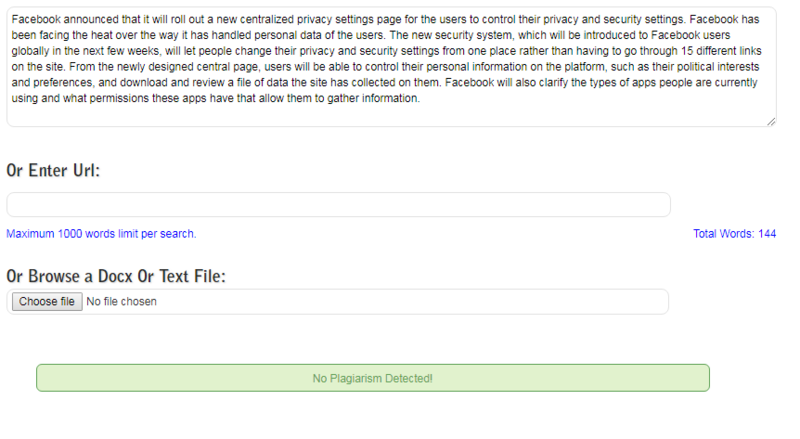 Facebook announced that it will roll out a new centralized privacy settings page for the users to control their privacy and security settings. Facebook has been facing the heat over the way it has handled personal data of the users. 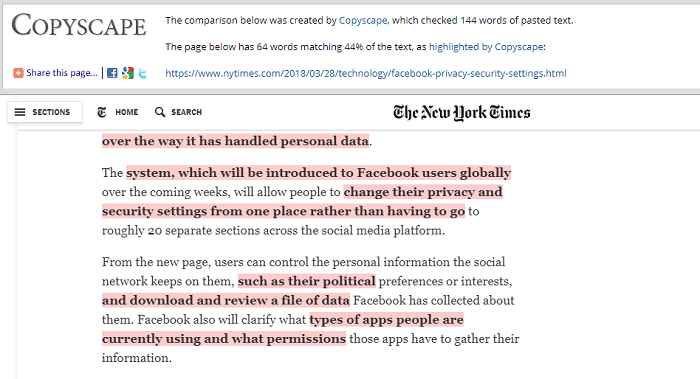 The new security system, which will be introduced to Facebook users globally in the next few weeks, will let people change their privacy and security settings from one place rather than having to go through 15 different links on the site…. As you can see, 44% of the text, 64 words, are matching on Copyscape. That is on the higher side but you will be surprised how some of the tools will even miss that. 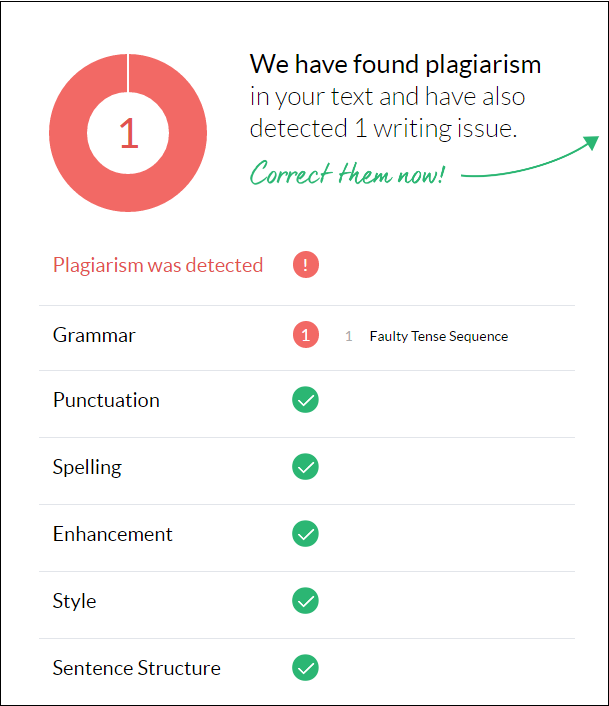 Grammarly, a well-known name in the industry, has a plagiarism checker too. You can use the free version but then you will be asked to subscribe for a 7-day trial. Plans start at $29.99 a month. When I entered the above text, Grammarly was not happy with it. The first thing Grammarly checked for was plagiarism and it detected the source. I tried it again with another sample and Grammarly passed it while Copyscape didn’t. Grammarly claims that they check snippets of text against billions of pages! It is a pretty well-known site and has gained a lot of recognition in the past few years. It seems Grammarly is only good when your source is a big site which is not good enough. Another widely recommended and totally free online plagiarism checker tool. Duplichecker UI is not the cleanest of them all, and the homepage was plastered with ads. It allows you to search for a maximum of 1000 words per search. The site claims to provide plagiarism check with “100% accuracy”. During my test, it failed to detect anything. Even when you copy paste 100% with no edits whatsoever, the site failed to work as advertised. The site is free and used and recommended by a lot of writers and bloggers which begs the question: how many of these writers are actually doing their job? Small SEO Tools offer a number of tools that will be appreciated by both bloggers and webmasters like image compression, DA checker, spell checker, backlink checker, and so on. The list is pretty long. They also have a plagiarism checker which came recommended in quite a few reviews online. The results were bad though. Once again, I was disappointed to see that the tool gave my blatantly plagiarised content a 100% clean chit. I tried again, this time with no edits and again got same results. The tool will also allow you to upload text from Google Drive and Dropbox. The word limit is 3000 per search. This led me to wonder how good their other tools were. PaperRater is a cloud-based grammar and plagiarism checker with a free trial available to test ride the service. The free plan will allow you to check a max of 5 pages for 10 times a month. Premium version is priced at $7.95 and allows to check 20 pages with 25 plagiarism checks a month. The premium version also offers other features like faster processing, ad-free experience and displaying matching text. Let’s try the free version. My work received 100% “originality” score in 3 out of 5 occasions with the NYTimes articles getting a clean slate. I was using the free version but wouldn’t recommend it to anyone based on personal experience. PlagScan is used by more than 1000 institutions and 1 million people, as claimed by their site. I have no doubt because it is recommended on quite a few sites and blogs. They have a plan exclusively for large organizations. PlagScan is one of the tools that works but not all the time. The NYTimes sample was given a 100% original score, but it did work with 3 samples from relatively smaller sites. I was asked to sign up for an account before I could download a report. Once, it came back with a different source than the one I used, Times of India, one of the largest news site based out of India. And, it was a copy paste job with no edits. The free account will give you 20 credits or 20,000 words check for free. Private plans begin at $5.99 for 26 pages after that. Not exactly cheap either. Plagium will allow you 1 free search a day after which you will have to shell out $0.04 for a quick search and $0.08 for a deep search. Anyone who is serious about plagiarism would like a deep search. Frankly, I was confused by the plan. I used the free search after signing up for a free account. Supports up to 5000 characters. Plagium found another source, Wikipedia, instead of the original source. 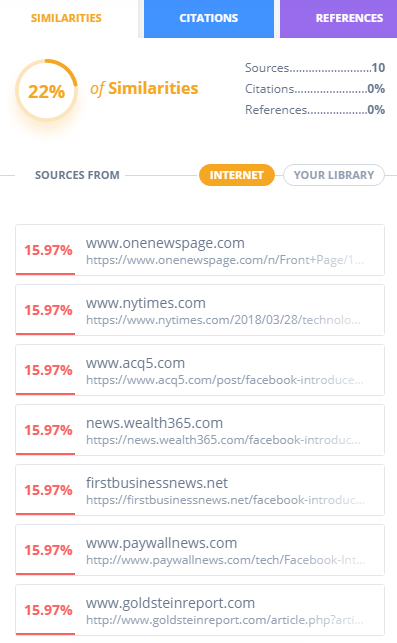 I checked the source link, which was not clickable and presented an error, and the page was a list of news published in 2007 while I used a recent one. Plagium worked but I wasn’t happy. It should have returned back to the original source that I used. It worked only twice, accurately. On one occasion, the tool was stuck at 30% for more than half an hour with no way to abandon the process. It was frustrating, to say the least. UniCheck came back with the source of the article along with several additional results. Right from the moment you land on the site, you will get a feeling of professionalism. The UI, the results, and the signup process all works nicely. The site is really slow and no match for the speed and simplicity of Copyscape though. On the plus side, it worked as good as Copyscape where it mattered. Copyscape is still the best online plagiarism checker with a clean and effective UI, no ads interface, and a stellar customer support. I know it because as a blogger, it is part of my arsenal of blogging tools. I liked UniCheck because of the same reasons. It works as advertised, has a clean UI with no ads, and I have heard good things about their customer support from some of my writer friends. If you are working with thousands of pages, UniCheck will prove to be a cheaper solution without compromising on the quality. If you are working with long articles, over 1000 words, then UniCheck will save you money as their top plan offers 2000 pages for $140 which comes to $0.07 per page. Copyscape, as we saw earlier, will get expensive with long-form work.